Gmail is one of the most popular email service providers because of its reliable service and clean look. It offers a way to arrange the emails we receive according to our requirements. We can decide the fate of an email before reaching the inbox itself. For that, we can use the feature filter to select a certain type of emails according to the guidelines we set and apply the specified fate to them. It can help you to categorize emails in your account by assigning different Labels to them. This tutorial explains how to create a filter with your requirements and how to assign this filer to emails. 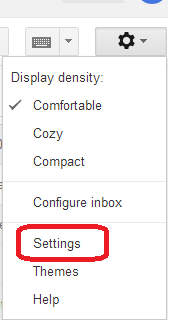 Settings tab is ion the right-hand top of the page. Click on Create a new filter. Now the filter options window will appear. Here you can see options to set filters based on the following criteria. After selecting appropriate actions click on Create Filter. Once we create this, all the electronic mails satisfying the condition will have the fate we have configured. We can use the same feature to remove any unwanted messages coming to the inbox from a common sender. Though the messages are not from a common sender we can use the same filter feature to delete all of them by creating a filter with rules those satisfies the common characters of these unwanted messages. Though such a filter can remove a large portion of potential spam from your account, it is possible to get the same fate to a few genuine messages if any of those, unfortunately, have same characters. So it is important to be very careful while creating a filter to avoid solicited messages from your inbox.